After two nights in the walled medieval stronghold of Monemvasia, we walked along its roughhewn stone streets for the last time and exited the tiny town through the sole entryway: an opening just wide enough for a loaded donkey to fit through. 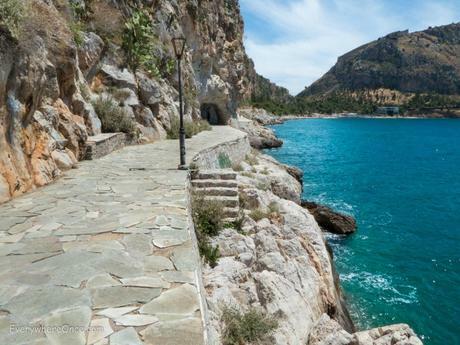 After reclaiming our rental car, which went unused during our stay in pedestrian-only Monemvasia, we continued on our way through the Peloponnesian Peninsula. 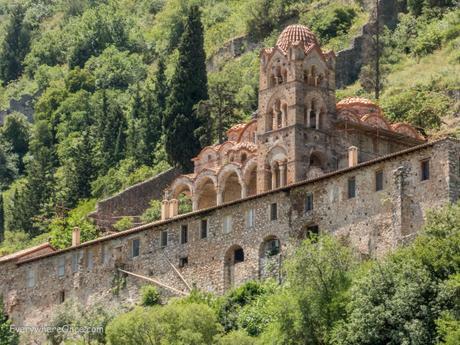 We had our first glimpse of Mystras from a nearby village, where we stopped to fuel up on Greek salads and stuffed vine leaves before exploring the fortified Byzantine city. From this vantage point, the castle ruins crowning the top of the mountain seemed impossibly high and far away, challenging to reach. A few hours later, we were standing in the midst of them. 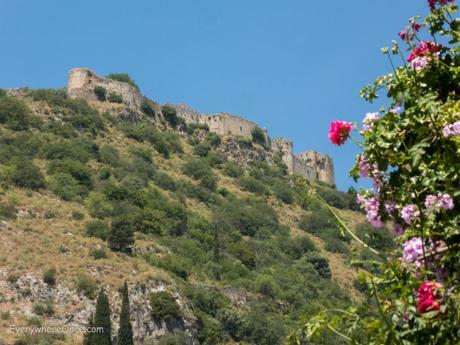 A zoom lens brings the ruins of Mystras’ castle up close. 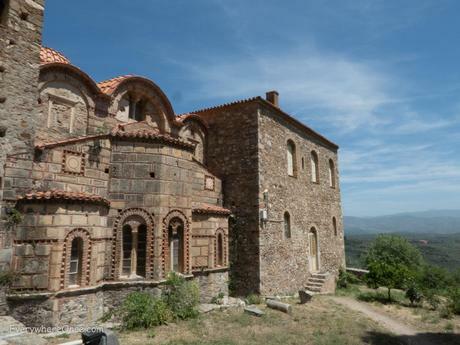 We hadn’t done much research on Mystras, just enough to know that it was worth a stop and that it was along the way from Monemvasia to Nafplio, our next destination. We thought we would stretch our legs, have a quick look around at some interesting ruins, and then be on our way. 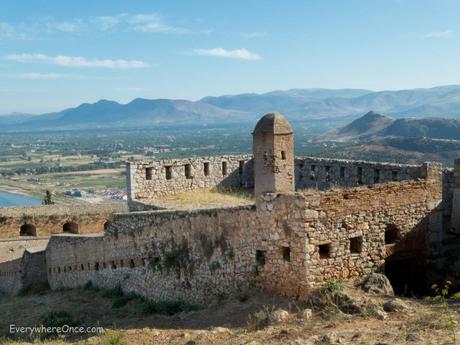 Once we entered the gate, we realized that Mystras was much more expansive than we had anticipated. Still, threshold crossed and tickets purchased, we were committed. 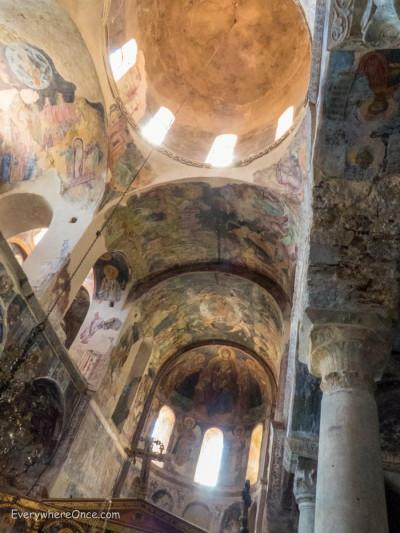 Unlike traditional museums where visitors must maneuver carefully and not disturb the delicate pieces on display, Mystras is hardy, more interactive, inviting us to blend in with the place. 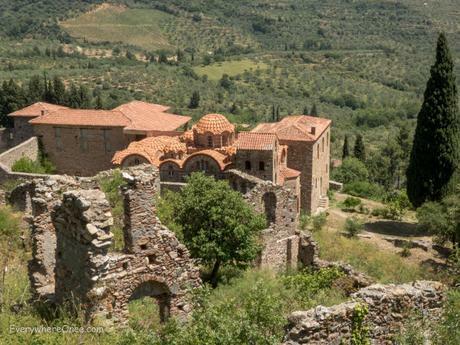 Mystras is divided into three sections spread across Mount Taygettus. 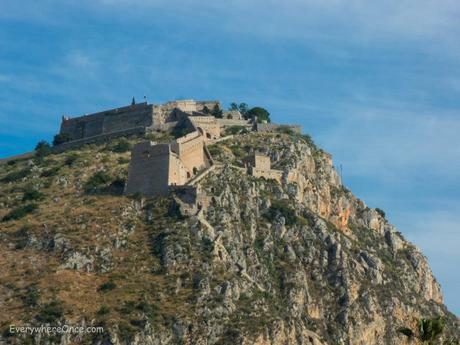 The kastro, the castle at the summit, is the oldest section, built in 1249 by a Frankish ruler. A decade later he was defeated by the Byzantines, under whose auspices Mystras gradually grew and expanded down the hillside. After two centuries of rule by the Byzantines, the city changed hands among the Venetians, Turks, and Greeks before residents abandoned it in the early 1800s for more accessible places in the area. A network of roads, alleys, stairs, and arched doorways leads through Mystras from the lower town, where we entered, to the upper town, the aristocrats’ one-time neighborhood. Along the way there is plenty to ogle and explore, from a museum and a palace to monasteries and fresco-adorned churches. Once we reached the upper town we had a decision to make. Call it quits or keep going to the castle that was still well off in the distance. Brian has the endurance of the Energizer bunny. I’m slow but stubborn. So we forged ahead, making way for the summit, where after a challenging hike the expansive views (and the sense of accomplishment) made it worth the effort. We then retraced our steps back to the lower town, where we had set out a couple of hours before—not knowing then that we would spend our afternoon scaling a mountain and conquering a castle. Our last stop on our Peloponnese road trip was the coastal town of Nafplio. 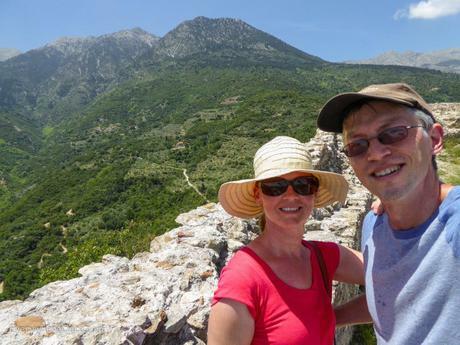 With azure waters, picturesque architecture reflecting Roman, Venetian, Turkish, and Byzantine rule, a looming fortress, and a medieval old town, it was a great grand finale to our time in Greece. 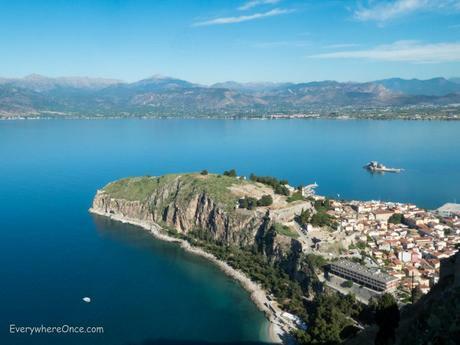 The focal point in Nafplio is the Palamidi Fortress, built under the Venetians’ rule. 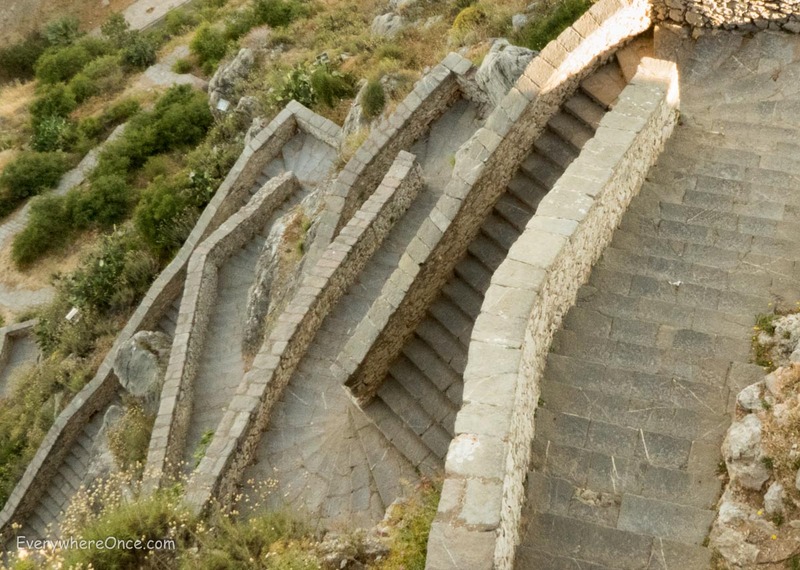 Situated high above the town, it’s not-so-easily reached via 857 steps. Once at the top, there are lovely views and a surprisingly large area to explore. 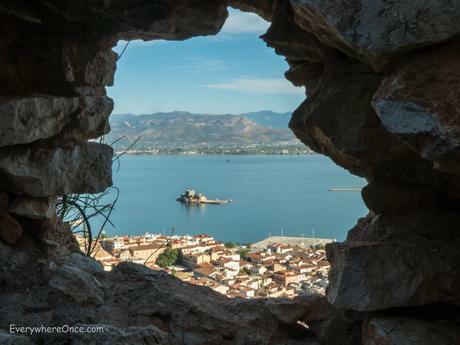 On an islet off the coast of Nafplio stands the Bourtzi, a small Venetian stronghold.